Sherwin Games has produced a few business simulation tycoon-type titles. As a matter of fact, they fall into two titles: the Game Studio Tycoon series and Food Tycoon. We’re going to get into Game Studio Tycoon 2. The GST games tend to feature the same mechanics which is good because you really don’t need to mess with a game development sim title too much. If you’ve played Kairosoft’s Game Dev Story or even checked out the Smartphone Tycoon games, you basically have a clue on how to move around. In short: your developer starts making games and resources are built up as the process continues. Once completed you release your game, it gets reviewed, and it will sale accordingly. As I said, the core gameplay of these games tend to keep it simple and don’t mess around the wheel too much. Where things get a little challenging–but fun–is that there little extras to manage. While you can train your team, it’s more like Game Dev Tycoon in that you can select what skill area to train and to what extent. You’re also able to select more than one genre at the start which is a welcome bonus. Everything else you will find in other tycoon games. You can upgrade your studio from your main character’s bedroom to a proper studio to an even larger studio. It costs more money but it results in you being able to get more resources in the development phase and complete non-development jobs faster. You’re able to attend a trade show to promote your game, there’s an end of the year awards ceremony, you can spend cash on advertising either to bump your fanbase or hype the game. 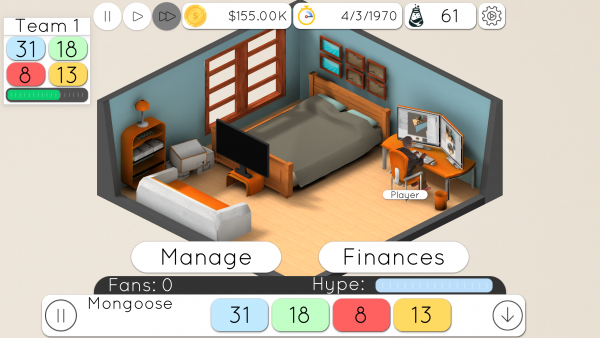 Game Studio Tycoon 2 also allows you to research technology that will allow your company to make sequels, improve graphics/sound/etc, and more. Game Studio Tycoon 2 is a fun business sim game for your Android or iOS device. You’re also able to play it on Steam and get it from the Microsoft Store. It sits right there between Game Dev Tycoon and Game Dev Story–not quality-wise but in what it offers. While there isn’t anything new here if you’ve played these kinds of games (especially focused towards game development), you’ll still sink hours in trying to get a strong team and state-of-the-art studio to make incredible games. That’s where the fun in Game Studio Tycoon 2 lies and it really delivers.